I've been using GCASH since forever. It played a huge part in keeping Archive Clothing alive and floating and also the reason to my constant whining over lost funds (coz of excessive shopping haha). If you are an avid GCASH user like me then Globe's newest promo is for you! It's their biggest promo yet so don't miss out on this one. You could win P100,000 everyday just by using GCASH to buy load, pay load, send money and donate. transactions to receive more promo codes. The good news is that you can win more than once as long as you have the winning promo codes! 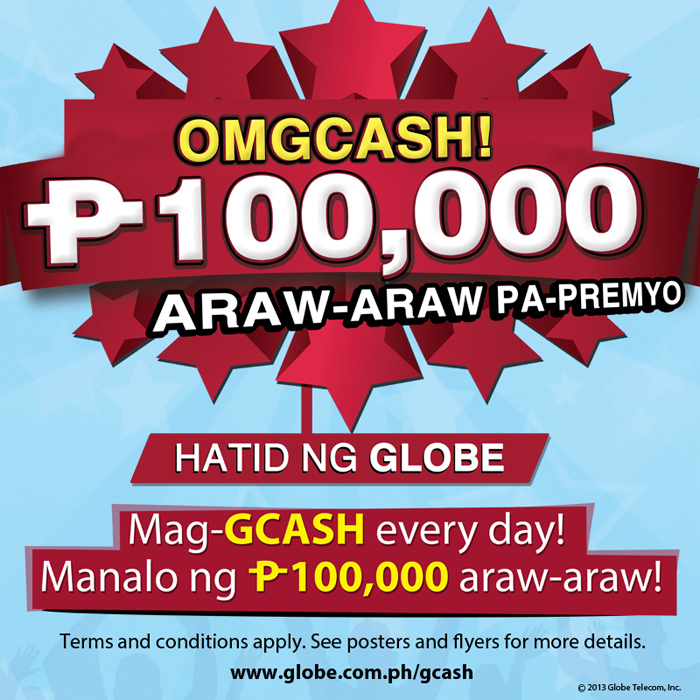 In addition, the first 10,000 Globe or TM subscribers who register to GCASH via the self-service menu *143# with the registration code GCASH100 during the promo period will automatically receive a bonus P10 GCASH! If you are a Globe or TM subscriber and not yet registered to GCASH, you can start registering now so you can join the promo! Just dial *143# on your mobile phone, select ‘GCASH’ and choose ‘Register’.